The Republican candidate for governor sees himself as a conservationist in the mold of Teddy Roosevelt; critics say his record suggests otherwise. Over the fireplace in Bill Bryant’s rustic vacation home outside Winthrop, a large portrait of Teddy Roosevelt greets visitors and serves as a source of inspiration for the Republican candidate for governor. Bryant, an outdoorsman who grew up on the Olympic Peninsula, fancies himself as a conservationist in the mold of the turn-of-the-century president. He points to Roosevelt’s influence in his own hands-on work to protect Puget Sound watersheds, while ignoring grander environmental gestures that are purely symbolic. Bryant has made the environment one of the centerpieces in his campaign to unseat Gov. Jay Inslee. It’s a risky strategy, with Bryant, a vocal supporter of the controversial Port of Seattle deal to host Shell’s arctic oil-drilling fleet, attempting to “out-green” an incumbent Democrat who has garnered strong support from some of the state’s most notable environmental groups. Bryant insists such support of Inslee is misguided. But when it comes to sound environmental policy and protections, it’s Bryant who’s the blowhard, some prominent green activists say. They contend the former two-term port commissioner who founded an agricultural consulting and lobbying firm has consistently aligned himself with corporate polluters and has failed to stand up against major projects that would ramp up oil and coal trains through Washington. When touting his green credentials, Bryant often cites his work on salmon-habitat-restoration projects. He was a founding member of the Stewardship Partners, a nonprofit that helps private landowners protect wild landscapes. He also helped launch the Nisqually River Foundation, which works with various local and tribal governments to protect that watershed. In that role, Bryant collaborated on conservation projects with the likes of the late Indian fisheries activist Billy Frank Jr. and former Democratic congressman Norm Dicks. “Bill’s love of salmon and Puget Sound and his commitment to making a difference in his life and through his actions are real and deeply held,” said David Troutt, chairman of the foundation’s board of directors. Bryant backed similar salmon-habitat-restoration projects during his two terms on the Port of Seattle Commission. 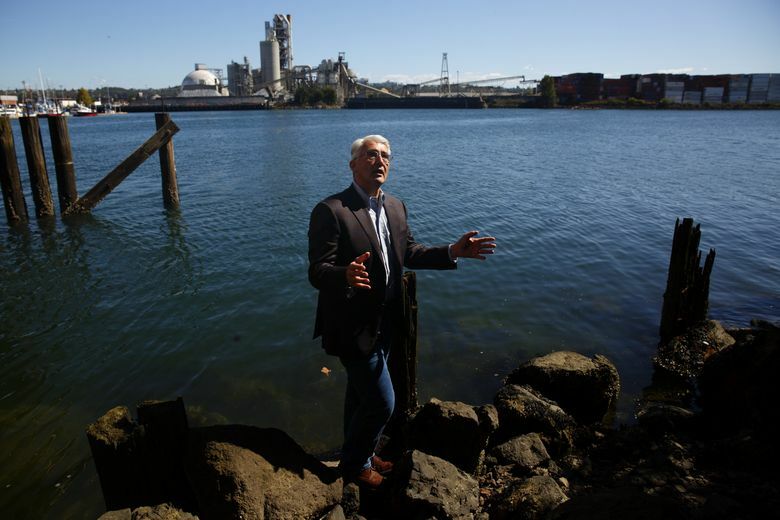 He touted cleanup efforts supported by himself and other commissioners that created parks and replenished habitat along the industrial Duwamish Waterway. The commission’s support of stream-restoration efforts around Seattle-Tacoma International Airport helped it receive the nation’s first “Salmon Safe Airport” certification. Bryant also points to a string of other measures he supported at the port, such as an innovative seaport stormwater-management plan, inventorying the airport’s greenhouse-gas emissions and developing infrastructure to bring aviation biofuels to the airport. But critics say such endeavors are undone by Bryant’s stands on some of the biggest ecological issues facing the state today. Bryant’s support of the Terminal 5 lease agreement, which allowed Shell Oil to stage its Arctic drilling fleet in Puget Sound, is paramount among those failures, Murphy and others said. Bryant contends the staging of the Arctic drilling rig — which drew hundreds of protesters to Elliott Bay — didn’t harm Puget Sound, and opposing it would’ve been merely a symbolic gesture that would cost hundreds of middle-class ports jobs. “His enthusiastic support of Shell’s rigs utilizing Seattle as a jumpoff point to Arctic drilling makes it clear he does not hold environmental protection as a priority,” she said. His opponents have also slammed Bryant’s voting record on cleaning up truck diesel emissions at the port. In 2008, he and other commissioners approved a clean-air program that included phasing out old diesel-emitting trucks and replacing them with cleaner, more efficient fuel-burning models by 2018. But after a study found dire air pollution around trucking routes through Georgetown and South Park, activists rallied for a faster cleanup schedule. Bryant was among three commissioners voting to table a 2010 motion seeking swifter action. During the same meeting, Bryant also voted against a resolution for the Port to endorse the federal “Clean Ports Act,” federal legislation aimed to clean up diesel truck pollution that was co-sponsored by then-Congressman Inslee. Heather Weiner, a Democratic political consultant who directed the Washington Coalition for Clean and Safe Ports from 2007 to 2010, said her alliance of environmental groups, unions and truck drivers sought to increase safety and workplace standards for the more than 1,000 cargo trucks traveling to and from Seattle’s port each day. “Bryant blocked those efforts at every point,” Weiner said. Bryant dismisses such criticism, noting his vote to table the motion on truck-emission standards was aimed at seeking more information. He added the commission ultimately adopted a revised motion seeking ways to speed up emission reductions that was part of the port’s broader clean-air strategy, for which Bryant touts a letter from the American Lung Association that congratulates him for his support. Bryant’s opponents also cite his donations from companies with troubled environmental records. During his two campaigns for port commission, he accepted donations totaling $5,000 from Rainier Petroleum and its executive, T.F. Mercer. Since 2009, the company had been illegally polluting Elliott Bay from its Pier 15 facility at the head of the Duwamish Waterway, drawing a lawsuit for Clean Water Act violations that ultimately led to a consent decree against the company. Meanwhile, Bryant Christie, the agriculture consultancy he founded, worked with several major chemical manufacturers, including DuPont, BASF and ConAgra. One of Bryant Christie’s customers, Bayer, was identified by the University of Massachusetts Amherst’s Political Economy Research Institute as the worst corporate air polluter in the nation in 2010. Bryant said his work with Bayer and the other firms amounted to selling them data about meeting environmental standards in other nations. In June 2015, cargo-terminal operator SSA Marine donated $3,800 to Bryant’s campaign, while the company pushed for a massive new coal-export facility at Cherry Point that would have ramped up coal-train traffic and potentially dust pollution through the state. Strong opposition from the Lummi Tribe, environmentalists and communities along the rail line helped block the plan this year. “If a terminal — like a coal facility in Longview for example — were to be able to meet those standards, then why wouldn’t we permit it?” he asked. Bryant’s response underscores a major difference in the two candidates’ environmental philosophies, Murphy said. Murphy noted that Bryant has mostly kept quiet on his positions about the Cherry Point plan and the Tesoro Savage Oil Terminal proposed for Vancouver, which, if approved, would be North America’s largest crude-oil terminal. While Inslee can’t publicly take a stand on the Vancouver proposal — he’ll make the final decision on whether it gets a permit — he has taken broad stands against increased oil and coal exports. Inslee, however, has said he wants increased regulation on such trains. On the ST3 ballot measure to expand regional light rail, Bryant said he’ll oppose it, in part because of its high $54 billion price tag and slow delivery schedule that he says won’t move enough people out of cars. But he insists he supports mass transit. Bryant also sharply criticizes the Department of Ecology’s new “Clean Air Rule” — imposed at Inslee’s direction — to cap and reduce greenhouse-gas emissions of large industrial polluters, including power plants, oil refineries, fuel distributors and pulp and paper mills. Bryant contends that by the state’s own data, the new rule would increase gasoline­ and natural-gas costs to consumers and kill 2,500 jobs while having no effect on climate change. Bryant and Inslee’s stances on the Clean Air Rule represent a fundamental difference between the candidates, Inslee campaign spokesman Jamal Raad said. Inslee believes action can be taken now to combat climate change, while “Bryant believes there is nothing Washington can do to lower carbon emissions and wants to freeze all new clean air and water rules,” Raad said. Throughout the campaign, while Bryant has dismissed Inslee’s strategy to reduce carbon emissions as a purely symbolic gesture that will have no effect on the environment, he’s had trouble finding his own footing on the issue.